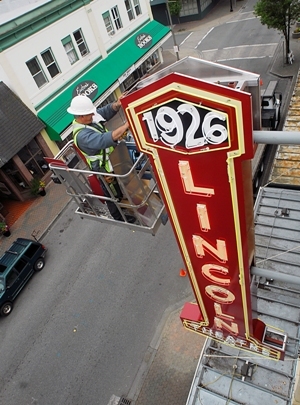 The Lincoln Theatre, a restored 1926 historic vaudeville & silent movie house in downtown Mount Vernon, presents a year-round schedule of concerts, current and classic films, and community events. The theatre works with local school districts, hosting school performances and workshops by performing artists on tour, as well as annual concerts by secondary school bands. The theatre hosts concerts by the local youth symphony, presents community-sponsored children’s theatre productions, as well as serving as a venue for fund-raising events by local service organizations. The Lincoln Theatre Center Foundation, founded in 1987, is a registered nonprofit organization supported by over 800 members from Skagit and adjoining counties. When the Lincoln Theatre was built, it was hailed for its originality and beauty. The original owner, Eldon Weigel Pollock, enlisted noted Seattle architect William Aitken to design the Lincoln in a modified Renaissance Revival style. 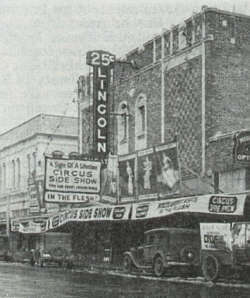 The Lincoln Theatre officially opened on April 21, 1926 to rave reviews. The Argus reported on May 13, 1926: "Nothing like it has ever been constructed before...the theatrical world is sitting back astounded." The Lincoln is what's called a period theater, which were in vogue around the time it was built. Some theaters built in the twenties had an Egyptian motif; one Seattle theater had a Chinese motif, but the Lincoln was a little different for the Northwest; it had a Spanish motif. Manager Edwin Halberg (business partner of Eldon Pollock) ignored the pleas of his friends that he follow the crowd and make it Egyptian. He foresaw a time when movie fans would tire of such a motif. He personally designed the luxurious carpet, the decorative effect on the walls, the hangings and draperies, and the lighting effects. The primary colors were blue, yellow, and red. The foyer was lit with quaint, wrought-iron lanterns with Spanish design patterns. The walls have what's known as a travertine finish. About a year after the theatre opened, the silent firm era gave way to the "talkies." Many classic films opened at the Lincoln during the years, including Al Jolson's The Jazz Singer and most popular of all, the Shirley Temple movies. 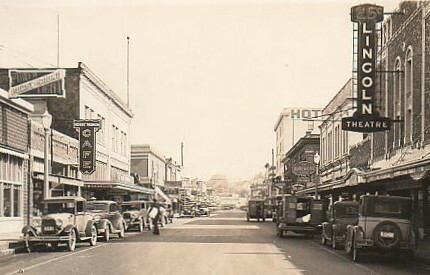 During the 1930's, the theatre was one stop on the West Coast vaudeville circuit. Traveling stage shows often stopped over in Mount Vernon enroute from Seattle to Vancouver, B.C. a tradition that continues today. 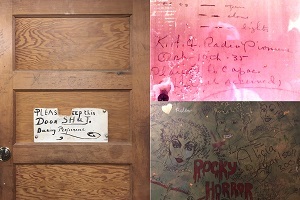 Many of those performers signed their names and write other comments on the plain wooden door to the tiny backstage dressing room on stage right, another tradition that continues today. The souvenir door eventually found it's way to a more palatial dressing room downstairs. Above: Projection booth photo courtesy of Damien Vines 2012. In 2013 we held a very successful 'Digital Futures Initiative' for the transition to digital projection as mandated by the motion picture industry. It allowed the Lincoln to continue to screen first run, art and independent films as it has for decades. We kept our 35mm projectors in the booth and will continue to screen archived 35mm film prints whenever possible. View more photographs of our projection booth and equipment room on the Film-Tech website here. There you will see many photographs, primarily of our projection room, taken in 2003 including the famous booth toilet. Continue at the bottom of the page for photos of the dungeon. Below: Brett Milton of Meyer Sign Company in May of 2011, putting on the final touches to the replicated original blade sign that was destroyed in the 1980's.